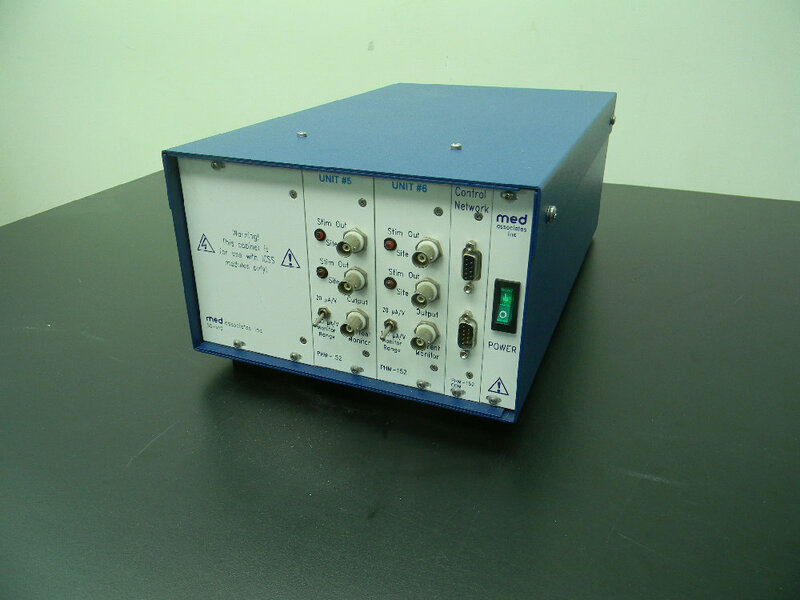 Med Associates Dual Programmable ICSS Stimulator with Monitor Output PHM-152/2 . New Life Scientific, Inc. This Programmable ICSS Stimulator is in great condition, except for minor scuffs from normal usage. We purchased all new water bottles and stems for this system, so these components are in perfect, new condition. It has been reviewed and tested by our technical staff and there is confirmed to be fully functional. Please refer to “Technician’s Notes” for more details. This system came from a working GlaxoSmithKline laboratory located in North Carolina. Parts and accessories for this system are still readily available. Constant current square wave stimulator is designed for intracranial self-stimulation, also referred to as ICSS. Used to deliver stimulation to one or two sites. After receiving the Med Associates system into our shop we inspected all of the electrical connections and connector cables. We verified all of the component power requirements. We supplied power to all of the units operating with no issues arising. Each of the components worked as they should without any issues. Unit was then removed from the tech shop and set up for final photography. Our products have likely been decommissioned and decontaminated by the original owner. However, in order to maintain a high level of safety, all of our products are professionally decontaminated with a water/bleach mixture.